With apologies to Mr. Samuel Taylor Coleridge, the title above accurately captures my sentiment this morning. 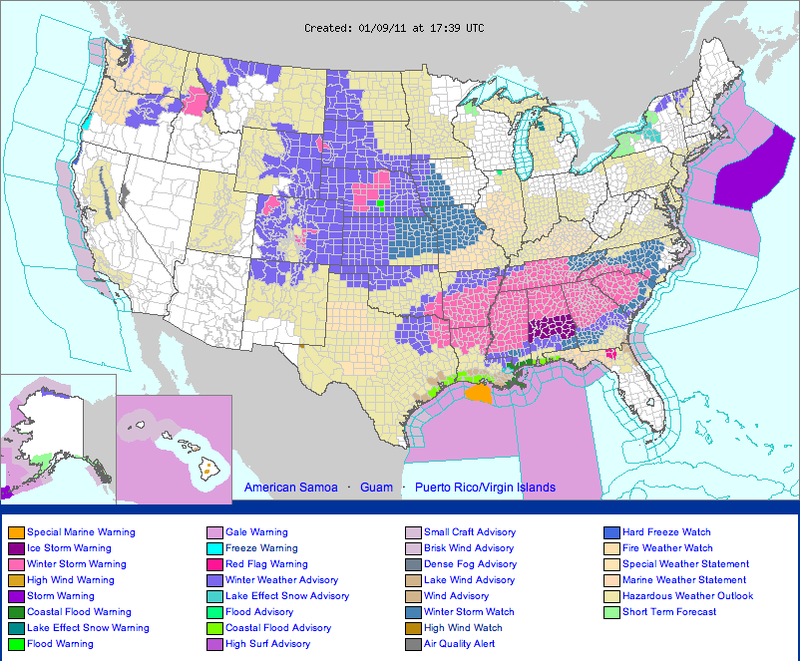 The 11:40 AM CST US Watch, Warning, and Advisory graphic above depicts two large regions of the country blanketed in winter weather headlines of various sorts. In the southeast, Winter Storm Warnings have been hoisted in response to a strong short-wave trough and surface low pressure that are, and anticipated to, bring heavy snow to areas unaccustomed to such weather. Forecasts for southern Arkansas, northern Louisiana, central and northern Mississippi call for up to 8″ of snow in the next 24-36 hours. Furthermore, in portions of southern Arkansas, there is an outside chance for upwards of 12″! In the plains, an assortment of winter weather headlines are in effect. This is in response to a developing cyclone that is anticipated to bring a fresh bout of cold air southward, but not nearly as cold as was previously advertised by the GFS model. Snow totals in the plains will range from a couple of inches in northern Oklahoma to upwards of a foot in portions of Nebraska. So, as a winter weather aficionado, guess where I am? You probably guessed it. I’m located in the little swath of no winter weather headlines located along and just south of the Interstate 44 corridor in Oklahoma. So, central Oklahoma will miss out on the enjoyment of a fresh snowfall but experience the misery of several days of below normal conditions. Joy.